Edelbrock Fuel Pump - Quiet-Flo Electric UNIVERSAL - MiataRoadster - Stay tuned with MiataRoadster! Manufactured by Essex Industries, one of the most renowned fuel system manufacturers, these state-of-the-art Electric Fuel Pumps offer maximum performance in a compact package. With anodized aluminum housings and high-quality internals, they are both strong and durable. Each pump is factory-tested and includes mounting brackets. The carbon fiber vanes and composite rotors give these pumps the added boost for maximum performance. The high quality construction results in a pump that is 4 to 14 dB quieter than competitors pumps at the same pressure. #1791 is factory preset to 6.5 psi and no regulator is required. With a replaceable screen type inlet filter and the free flow rate of 120 GPH is sufficient to supply 600 hp. #1792 has a free flow rate of 160 GPH, enough to feed a 1000 hp engine. This pump is factory preset to 12 psi and requires an external regulator such as the new Edelbrock regulator #1727. Warranty will be voided when used with diesel fuel. 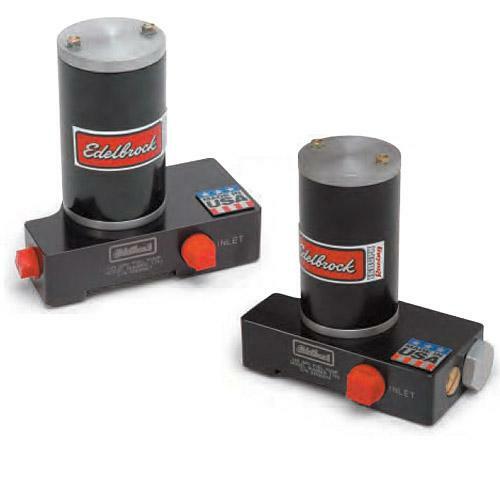 These EFI fuel pumps are also manufactured by Essex Industries. With anodized aluminum housings and high-quality internals, they are both strong and durable. Each pump is factory-tested and includes mounting brackets. #1790 features a -10 AN inlet/outlet and a flow rate of 80 GPH at 45 psi for use with high-hp fuel injected applications. The in-line design keeps the pump motor and components cool even under harsh conditions. The new Victor EFI fuel pump #1794 is rated at 120 GPH at 45 psi and has -12 AN inlet/outlets and is compatible with all grades of gasoline and methanol type fuels.